Illusion is a distortion of the senses. The brain picks up visual cues that are recognizable, instantly fitting them into familiar patterns. In a flash, it issues a report about what’s going on. The brain fills in the blanks. Normally, we “believe” what we see. However, sometimes we’re reminded that our brain isn’t infallable and that our perceptions aren’t necessarily reality. In fact, we can have an “ah-ha!” moment when we realize that what we see is an illusion. 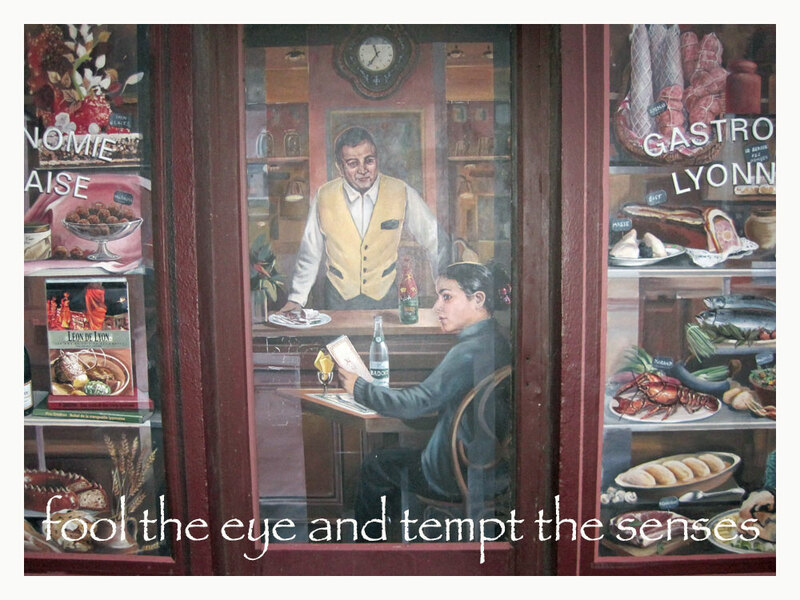 Trompe-l’œil, is French for deceive the eye. As an art technique, it’s been around for millennia, dating back to Greek and Roman times. Quite simply, it’s the art of using extremely realistic imagery in order to create the optical illusion that the objects actually exist in three dimensions. But they don’t. Yet our brains send the signal that it perceives 3-D. Even when we know the illusion is not “true,” we still find ourselves wanting to believe it. There’s an old Greek story about a contest between two great master painters. The first, Zeuxis, created a still life that was so convincing, birds flew down from the sky to peck at the painted grapes. In order to judge his rival Parrhasius‘ painting, he was invited to pull back a pair of very tattered curtains, and step into Parrhasius’ study to view the masterpiece. Zeuxis tried, but was unable to do so, because the curtains were the painting—thereby making Parrhasius the winner! 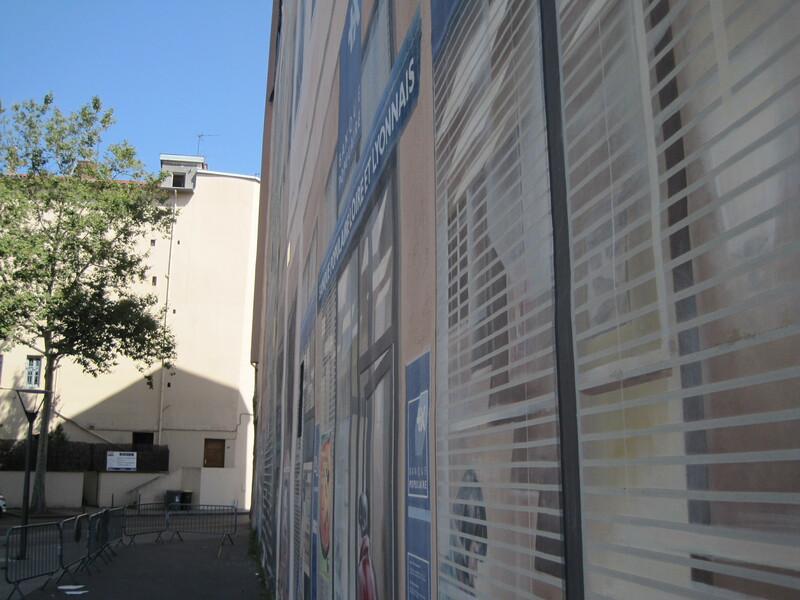 Soon after arriving in Lyon, I happened upon an intimate little area along the Saône River called Place St. Vincent. Everyone was looking up and pointing, so what else could I do but look up as well. I resisted the urge to point. My gaze scanned a typical scene. A beautiful old building with a rich ocher facade stood before me. It was absolutely there, loaded with typical French details. These building are certainly no big surprise. However, this one was different. But how? Each window had a delicate balcony overlooking the streets below. On each balcony was one of the great “celebrities” of Lyon. Wait a minute! What’s going on here? There were saints, emperors, doctors, civic leaders, painters and poets. I would have sworn that they were actually up there on the balconies. But, of course, they’re not! How fascinating! The mural at Place St. Vincent isn’t just an isolated curiosity. 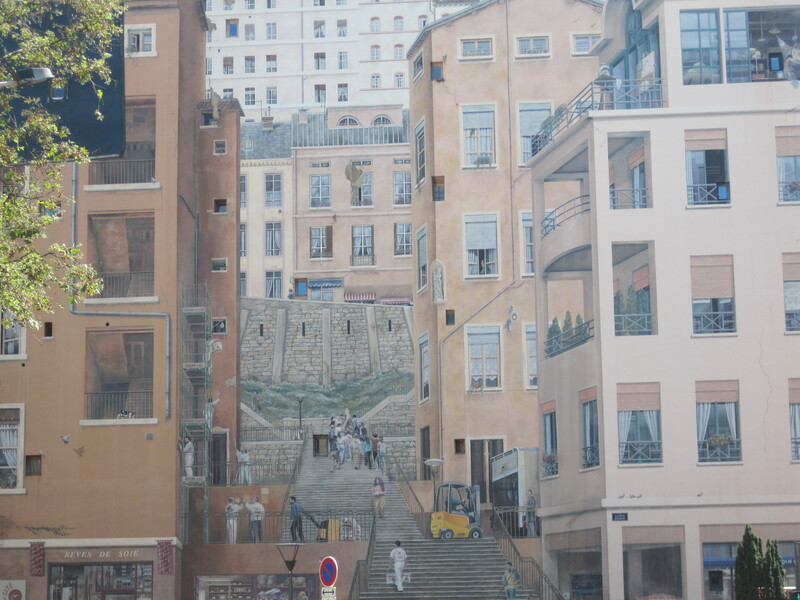 In fact, Lyon has over 100 detailed murals throughout the city. The bold idea of creating such public works of art was pioneered by a group that came to be known as CitéCréation. Since their formation in 1978 they’ve become leaders of urban murals, with over 530 monumental frescoes around the world. Incredible! 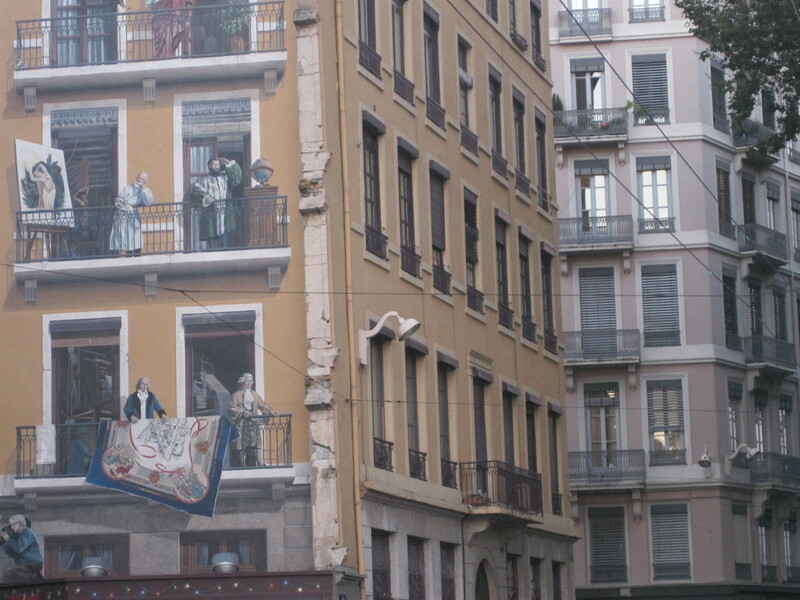 Lyon has intentionally developed itself into a treasure trove of urban artistry. Not only does it speak to their support of the arts, but also an interest in depicting the Lyon culture and history. side view of mural above—perfectly flat wall! What I find so interesting about the paintings, is how fascinated people seem to be with the idea of “illusion and trickery.” When we literally can’t believe our own eyes, it’s a very big deal. There’s an immediate respect and admiration extended when someone successfully fools the public with no harm done. People have always been in awe of clever and outrageous stunts of deception. Take Houdini, David Copperfield, or Criss Angel as examples. Well . . . the “magicians” of the art world have been perfecting their craft of decorative deception with amazingly magical results! Trompe-l’œil artists are the Penn and Teller of the art world. It’s all about transparency. Rather than using sleight-of-hand, they actually show you how they do their tricks. Even though we know exactly what’s going on, we’re still amazed. so . . . what’s real? So why is trickery so compelling? Maybe we just love fantasy, and the idea that this hard-edged world can loosen up a bit on occasion. It’s fascinating when reality gets a bit fuzzy and blurs around the edges. For just a moment, we exist in some middle-ground where it’s hard to tell what’s actually going on. Is it real, or is it not real? Then, suddenly, someone breaks the spell by metaphorically throwing back the tattered curtain to reveal the truth of the matter. We laugh like little kids at the circus, and stand wide-eyed in amazement. Something about trickery has a deep-seated appeal to our inner child. We love it when that happens! Note: You may also enjoy some of our other stories about our time in France. Wow some of those murals are unbelievable. I guess that’s the point though. Haha. Yeah, there are some really talented people out there. Can’t imagine doing that. Glad you enjoyed the post. Stick around . . . there’s much more on it’s way! These images are wonderful! I wish other cities would do this more often. Glad you enjoyed the pics. 🙂 And this is why I so enjoy Edgar Mueller’s work. Excellent analysis. his work is awesome, and really takes the fake-out to whole new level. Absolutely true — but it definitely explains our fascination with illusion. It makes us question our very selves! We read your 2.0 story. Very creative, funny and serious as well! Wishing you the very best. Lovely idea. Thanks for inviting us in to your Tuscan world. And thanks for joining us! This is great! You probably will find my blog helpful. (italpier.net).Buona fortuna. Pier. Thanks for the comment. We checked out what you are writing, and agree, that it will definitely be interesting for us. Thanks for the heads-up—we subscribed, so you better keep writing some good stuff! I don’t often check “Freshly Pressed” but I am glad I did today and found your blog with today’s post! Beautiful blog. Tuscany is on my list of places to visit. We’re glad you checked freshly pressed too. However, one slight point that we didn’t make very clear. 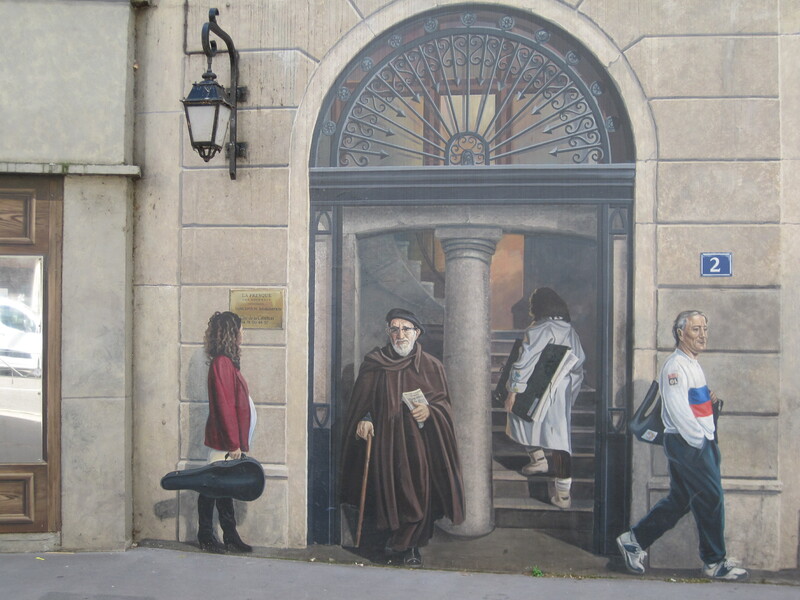 The story was based on our visit to Lyon France where those particular murals are located. But, Tuscany MUST be on your list in any case, murals or not. See yu there! By the way, we enjoyed your story about the hole in Texas. We had no idea. Very informative. And, our vote is to just leave that hole there. We may be just a little late on that one. I have loved Trompe-l’œil (never knew how to spell that) since the first time I saw it on “Reading Rainbow.” 🙂 There is nothing like it! Unreal creations are always intriguing. I love them !! Thanks for putting them here. The fun of it is to be caught off-guard. To walk around a corner and boom—there it is! Where you least expect it. And . . . thanks for reading! Please come back to see us again soon!